Rent a great photo booth at a great price! NOTE: This photo booth must be setup out of direct sunlight and protected against wind. Indoor setup is recommended. 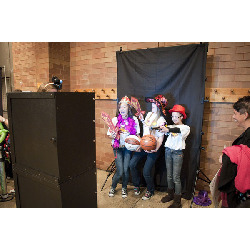 For outdoor events we recommend the Enclosed or Deluxe photo booths. Flat area indoors or outdoors in shaded area.